Public transport that’s frequent enough that you don’t need a timetable is critical to willingly get people out of their cars and out of the traffic. Frequency is particularly important to cater for a network of services to make anywhere-to-anywhere trips are possible with the minimum of waiting. To draw an analogy, you don’t need a timetable (or face a 20-30 minute wait) when driving your car through a major intersection or freeway interchange. Some services already run frequently — in peak hour particularly. Thanks to governments of both persuasion now recognising its importance (and/or being forced to add services thanks to overcrowding), as well as the transport bureaucracy getting behind it, more parts of the network are getting to that magic “every 10 minutes” standard, though promotion to actually tell people it exists is lacking. In fact while there are some issues with proposed Transdev bus service changes in 2015, one change that’s welcome is route 903 between Box Hill and Mordialloc (including Chadstone) will be upgraded to every 10 minutes on Saturdays. Unfortunately the western end of that Smartbus route, at Altona, will suffer from service cuts of up to 50% — the current 15 minute off-peak service will go to 30 minutes. Apparently this is due to the former government’s wish to squeeze more efficiencies out of the bus operators — not necessarily a bad thing, but it may have gone too far. A case of one step forward, one step back? And the beauty of it is, many service upgrades are possible now, particularly at off-peak times, without huge investment in infrastructure, so there’s a huge opportunity to make a lot of progress in the next four years. 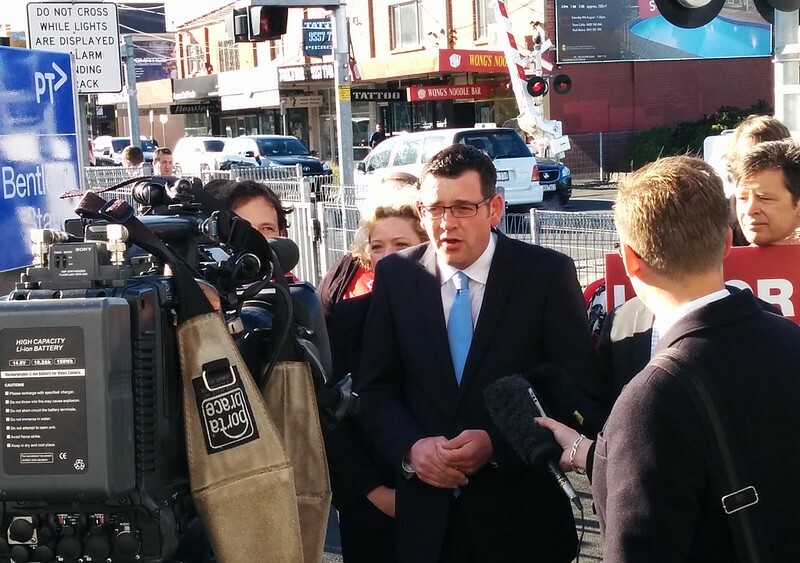 We’ll find out who the new Public Transport Minister is today — let’s hope they and the Premier will be keen to push ahead with implementing Melbourne’s frequent network. Update: Lynne Kosky: Very sad to hear of former transport minister Lynne Kosky’s passing at just 56. It was under her that serious PT investment (especially train fleet expansion) started. This interactive graphic shows the projects underway in 2009, during her time as minister. (And no, she didn’t start Myki… that was a Peter Batchelor creation). RIP. Update: New minister: Jacinta Allan is the new Public Transport minister. In related portfolios, Luke Donnelan got roads, and Richard Wynne got planning. ← Previous Previous post: Election wrap-up: Counting continues, East West Link, and Pudding! Some of the cuts with the proposed changes, are on busy routes. It seem this tendering hasn’t really delivered the great improvements promised . I am very hopeful of at least two new SmartBus routes operating in my area, and aim to start campaigning to get them very soon. As for the Transdev matter, It can seem that if Labor is quick to act, they just may mitigate the worst of these negative changes. Any word on whether Labor are going to retain the Lib’s plans with regard to frequent services, i.e. rolling out 10 min frequencies out to South Morang and across the ‘principal’ bus network? And an article on the proposed changes.